How to trap and cap. With the latest releases in research, gear and boosts from higher hero levels, traps have had an interesting time lately. We were able to catch up with one trap who has adjusted well to all the new items. The trap we are looking at specifically runs his sh30 with VIP 43 and a hero at level 80. He also has his pantheon at 19 and maxed his orbs for defence on his barracks, walls, embassy and altar. He has completed all the latest research (UM,MT,BM,Runes…) to level 10. His troops are an even spread with two thirds regular and one third wild within the tiers he uses (T2,T4,T5). His troop count is close to 800 billion strong. He uses mythical gems in his gear and his current power is at 9 Trillion. He also had a few other thoughts on traps both higher and lower in power that he is at this time. For a trap at roughly 19 Trillion power, you would need around 1.7 trillion T2s and the T4-6 that you would need to un-nerf the tier two troops. That, combined with a defence of around 25k, should help your trap win on rallies. For one smaller in power, say at 5 Trillion or less, it could do very well, although it is a bit more expensive, with a total net defence of 116k with far fewer troops. 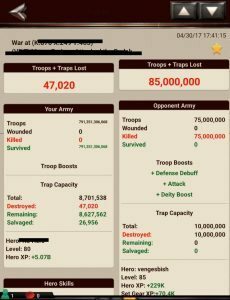 Troop counts there could be as little as 360 billion T2 along with the required T4-6 to un-nerf the lower troops. The variations of configuring successful traps makes for exciting times for those loving math/puzzles/issues and how to solve them. It also gives hope that traps can survive the latest releases. I’m at 425 tril power and was 865T capping against 160m rallies no boost offline till I was caught offline when they decided to update the vip to 50 and was being brought down to 333t power in 6 rallies lol the game is changed a lot that’s for sure! But being the under dog is exciting so I keep grinding the loop hole’s in the game ??? So glad I stopped playing this game. I used to love trapping because it was cheap and sustainable. I remember when 2.4 mil t1/t3 even split with hero 50 was a devastating trap. Now we’re talking trillion-power traps? Dafuq. Can I run a troop set up with just T2 and T5 and T5 traps ??? And since this article is talking about 85M rally and now is 150M or 185M rallies I’m not sure but should the goal be 3T troopd T2’s ??? Can I do my troop set up with T2-T4-T5, it’s to expensive to train T6….. Awesome helps hon, thx much for sharing. Couple questions…. do u account for any siege troops/traps at all? If so, how do they figure in the equation? Also, what about the t3/to t5 & 6 ratios? How do u figure your wall traps as well? Ratios & trap types? Do u have all the other trees not mentioned fully completed or just to 10? I beg to disagree, The Ultimate Gems are way more efficient in terms of trapping, if you have 7 sets of Ultimate Divine, or Mythical Divine Gems i would definitely add them, This is assuming you’ve completed the Gem Set Bonus tree, as with set bonus these sets give you substantial Legion defense which can be manipulated as the game stands right now, because rally leaders cant debuff legion defense to 0% as the game stands, i would advise you look into them and run tests like i did, you will notice the difference. But yea my best results over the years has been being a t2/t4 all regular troops trap, my advice is if you don’t have the research then don’t train the troop! Or you’ll burn really quick! That basically means he/she wasn’t skilled properly and/or was careless with his Regular troop count! I’m a 3 dag mix gear trap and was maxed research up until this new research came out and was eating rallies with 4t power with nothing but 110B Regular T4/T5/T6 troops and T1/T2/T3 Regular traps. The new things have definitely made it harder for traps and it seems MZ just keep adding lots more Attack and not enough defence and other bits to help us counter the treminous attack stats,., , it’s becoming unfair, …. But I am determined to keep it going (Well for Now!) and changing my trap, but if they again offer a ridiculous amount of Attack boost hours before a kvk which then kills all the work I’ve just put in ready for the kvk, then I will quit too, i would be gutted,! I’ve played for years,….. Seems they keep feeding rally leaders,!! They need to remember, these rallies need to hit things, if MZ keep pushing us away, rally leaders will have nothing left to rally,….!!!! Whats yr hospital/barrack split? Wot stat figures should we aim for? Im new. I’ll grant you that CJ, hard to go after an inferno when the BIG prize for first place is apollo cores, and a batch of chests for gear even more outdated than that. How did my “never posted” email addy get on that post? Great article! I had to switch to different gear because I was burning badly. You said you had to change back to safeguard is this better than the new ultimate gems? To counter the defense debuff? I found only way to cap is to boost attack debuff like 50k which is crap because you would need to stock up on these. I really don’t want to go over 5T. I like being tiny ?? @Huncity – Yes that 150k Defense Debuff boost is very annoying. But 3 Kunai counter it nicely. There are many theories about how Defense Debuff Resistance works. You may disagree, but I believe that when you have 110% DDR, nearly 100% of Defense Debuff is taken away. I did take one rally this week from a lead who said they used that boost. I capped it no problem. @MZ pwns my CC numbers – T1 have the best strength per power. But traps realized this and started building t1 monsters, and that caused MZ to nerf t1, and also t2 to an extent. If nerf didn’t exist I would run 2.5t or 3t t1!! But it does, so it turns out the next best strength per power is t2. But you have to un-nerf them with a few higher tier troops. 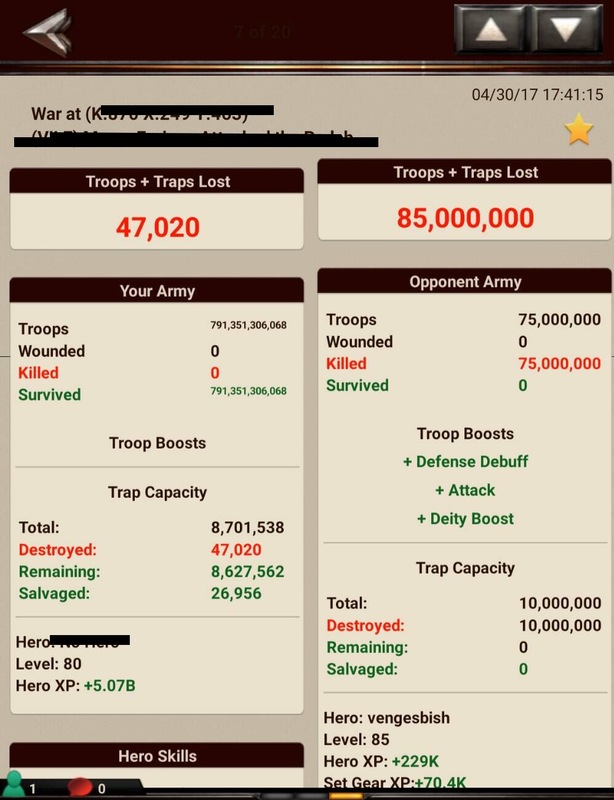 @spinix2 – The 25k defense figure was the combined total of all defenses (troop + typed + legion etc), after all debuffs and resistances. @Bill South – That was an error, sorry. I was using Ultimate Divine gems, not Mythical. 7 sets were available last weekend in a $50 pack. But with the new Pantheon research I’ve moved back to Safeguard because I can’t get over Legion Defense Debuff anymore, because I haven’t done any of the new Pantheon research. Last bit, this build is actually kind of classic. Traps have been running builds like this for well over a year. The only thing that’s new, really, is the extraordinary number of troops. But with over 11m combined attack, you really need to be stout! Today I went to over a trillion troops (12t power), and capped a player with maxed Pantheon research. Maybe I over-built and can reduce troops? I’ll have to see. May your prisons be full of leads, and your inboxes of hate-mail (and CRR requests)! Good luck! Nice explanations… I’ll like to ask … for a trap as I am now… what’s the troop count and troop type to stand a rally niw days with t6 out now ?.. 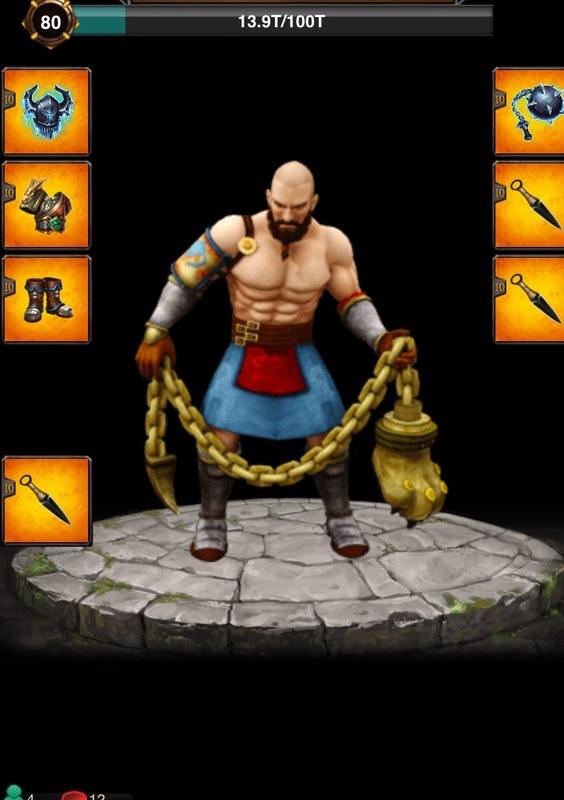 “He uses mythical gems in his gear” – Mythical gems? cute artical but seven Mythical Divine gem sets is hundreds of dollars. Please interview a trap player who was capping max rally leaders before the April 24-28 debacle of releases and who has spent no more than $20 since those. Traps are no longer affordable to play. A 9 trillion power trap lol is that a joke??? Who wants to keep dropping cash on a game where everything you do is obsolete in a weeks time? This game is the worst cash grab in the history of cash grabs. This is a whale game pure and simple. Prizes in contests are atrocious,not nearly enough rss in packs,research is outrageous,training t6 is almost as bad as the research! 3/4 of events…are buy events! Buy this buy that and in the end all for nothing when new updates come out the next week. Every week there’s at least 2-3 new updates. And don’t forget the glitches…like researching and never gaining power or can’t use garrison to promote or kingdom events disappear in the middle of training and or researching. Game of war fire age has NOT gotten better ONLY WORSE by far. 19 trillion Power with 1 trillion troops in full Laval gear burning tonight after the new research and boost. Firstly because surely there can’t be anyone out there playing seriously that has only 25k troop defence but also because every rally lead in the game has enough defence debuff to zero 25k defence without even putting his cores on. Did you perhaps miss out the word “legion” before the word defence. That would make a lot more sense since after debuff you’ll still have 15k legion defence boost or is it perhaps combined defence stats net of their respective debuffs and resistances. Already quit I just check in to see what crazy stuff they have come out with. My advice is quit now and save your money. What’s the new troop count and type for trap account .., niw that t6 are out.? depends on what lvl your Hero is ? Cause if your Hero “only” is lvl.80 ! you will get in trouble if you get attacked by a player with a higher Hero lvl ! cause with the new lvl´s 81-85 you get crazy power.. Exactly! Kunai is no longer effective in our kingdom unless you have higher than 82 hero and over 60k defense. T2 is no longer working with being hit by hero lev 85 and new cores. Im 9 tril power and burnt badly. UM to level 10? thants too expensive! Crunch the numbers and make it obsolete in a week. Every Wednesday and/or Friday something new is released making the previous week, gear, gems whatever irrelevant. For those who like puzzles lmao call it what it is…. the death of the game.